Good afternoon! The Red Bulls are back in action tonight (7:30pm ET, MSG), @The Cathedral of Football, against Eastern Conference rival Columbus Crew. Let's examine how both clubs come into this one. Like the Red Bulls, the Columbus Crew went winless, through the month of May. Columbus lost twice and tied twice last month, with their last win coming on April 30th. Also, like the Red Bulls, set pieces have become a sore spot for the Crew - but for a different reason. Columbus used to be a leader in getting goals from set pieces but they can't buy a set piece goal this season. Bad news for them, but good news for RBNY. The Red Bulls come into this one with six regulars out, due to International duty. Another RBNY player, center back Carlos Mendes, was injured @Vancouver and just returned to training late this week. The regulars will need to be very sharp to help our team get a great result (as in a Win) today. Red Bulls fans can only hope that Henry and Rodgers (who was just tipped by Henry as being an MLS Golden Boot candidate) continue their goal scoring exploits against Columbus. With all that in mind, let's get to some predictions! It's backs against the wall time for the Red Bulls. Get three points and we are right back in the thick of things. Anything less and the naysayers will have a field day. I like the fact that we have Henry and Rodgers both starting (our best striker pairing), and there is still plenty of talent in midfield. The only area I worry about is our backline. I could see us conceding, hopefully not another penalty, but I also think we'll score a few. My prediction? 2-1 Red Bulls, with goals from Henry and Rodgers and one for the visitors from - who else? - Dilly Duka. I'm going to predict a Red Bulls loss here. Columbus has had our number for a bunch of years now and, with so many of our regulars out, I just don't see how we can take all three today. I'm going to say New Jersey's own Eddie Gaven and Dilly Duka put one each past Sutton and Luke Rodgers gets the consolation goal for us. Final: RBNY 1 - Columbus 2. With our front line and midfield still largely intact, we should be able to put a couple past Columbus today, but I can not predict a win anymore until I see that we're capable of creating one. A completely unsatisfying, unacceptable 2-2 draw tonight as we kiss our Supporters' Shield chances good-bye. Rodgers and Lindpere with the goals. Tonight's bogus penalty will be called on Solli. Columbus' other goal will come from a corner kick to the head of an unmarked Chad Marshall. Coach Backe will make his first ineffective substitution in the 78th minute, and his second in the 89th minute. Oh, the US loses 2-1 to Spain. America's one goal will come off the foot of Juan Agudelo and the hype machine will once again be firing on all cylinders. Following the match, Landon Donovan tweets, "Wait? I'm confused. Who is David Villa?" Oh dear. 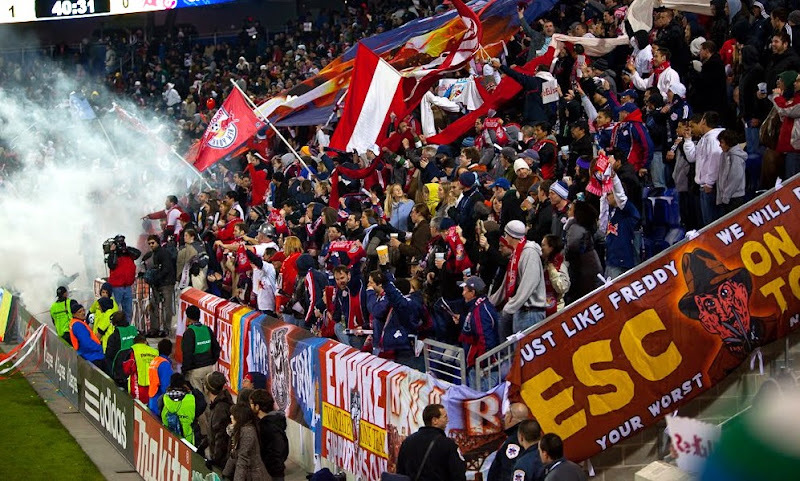 Well, remember when we used to go into Red Bulls games expecting to win, and convincingly at that? Now I tune in wondering whether we'll scrape a draw. I don't know what has happened lately but it's a sad state of affairs. Are we a one trick pony that has been found out quickly? Tonight is a tricky one to predict due to the absence of half our team. Will that weaken us, or will the fresh faces in the line up revitalise the side? We still have Rodgers and Henry up front, and the likes of Solli, Tainio and Lindpere in the line-up, so on paper we should still be bringing in the points. But before I can be positive, I need to be given a reason to be. Sitting here now, there is no reason for me to expect anything than a loss tonight. I'm going for 2-0 to Columbus Crew, unfortunately. But I'm desperately hoping for three points to get our season back on track before the Red Bulls train completely derails. Alrighty then! Look for our Award Winning coverage of this one in the coming day, or two. Viper Out!